This weekend is Australia Day long-weekend. It’s been a weekend of celebrating with the quintessential Aussie barbie (BBQ), wearing the Australian flag printed on one’s t-shirt or bikini, screaming out “Aussie Aussie Aussie oi oi oi” (unfortunately) and eating lamingtons (very fortunately). For some however it’s eating pavlova, and I’ve seen a fair few of them proudly shown off on Facebook and the usual social media sites this weekend. Now I know there’s some debate (actually, a lot of debate) around the exact origin of the pav, I’ve even discussed this in a recent post. Yes I know it hails originally from New Zealand but for many it is still a major part of Australia Day celebrations. Since we don’t actually have very many dishes we can call upon as being authentically Australian cuisine, it’s understandable why. During the few days leading up to Australia Day I was having some thoughts as to what makes up authentic Australian food, and there actually isn’t much. We have beautiful indigenous Australian bush foods but they’re really more ingredients rather than actual dishes. Just about everything other than “bush tucker” as it’s colloquially known, including a large percentage of our population is from someplace else. This I very much believe to be one of the many things which makes Australia so incredible. Our multiculturalism, and in turn our food. For example, may parents were migrants who came to this country in the late 1950’s (I am a first generation Australian). I grew up eating a lot of Eastern European and Chinese food as well as many Anglo-Saxon favourites. I loved piroshki as much as a finger bun (for overseas readers this is a soft wheat flour bun with icing on it), yum cha as much as a meat pie with sauce. My Polish-Russian father enjoyed Vegemite sandwiches, my Chinese-born Russian mother loved (and still loves) a passionfruit and cream-filled sponge. So in honour of Australia Day and multiculturism I created this Pavlova. I hope you enjoy her. She’s an adaptation of an Aussie/Kiwi classic merged with European flavours, and she’s a bit like this country: big, beautiful, diverse in flavour, and she speaks with a slight accent. That’s what makes her so special. * To make chocolate curls run a potato peeler down the edge of a block of chocolate. ** To make chocolate shavings use an ordinary fine grater or a Micro-Plane. 1. Preheat oven to 220ºC (approx 420˚F). Place a sheet of baking paper on two large baking tray and draw 20cm (8″) rounds. 4. Sift the cocoa powder into the raw meringue and fold through carefully ensuring you leave streaks of cocoa rather than fully incorporating it. 5. Shape the meringue into the two rounds on the baking paper/trays. Place meringues into oven and immediately turn temperature down to 120 degrees celcius. Bake for 90 minutes then turn off oven, do not remove meringues until oven is cool. 1. Drain the morello cherries into a colander with a bowl underneath it to catch the syrup. Give the cherries a shake to make sure the syrup drains out of them. You will want the cherries quite dry so give them a bit of time to drain. 2. Pour the cherry syrup into a saucepan and over medium heat reduce it down to a honey-like consistency (about 5-10 minutes). If you over-reduce you can add a little bit of water and whisk through to make it more liquid again. Set aside. 3. Beat the cream with the coffee until stiff peaks form. With a silicone spatula spread half of the cream over the bottom meringue, place cherries on the cream along with half of the chopped walnuts. Sprinkle half of the chocolate shavings over the meringue. 4. Place the top meringue layer over the bottom. Spread the remaining cream over it along with the cherries, nuts and chocolate shavings. Top with the chocolate curls. Drizzle the cherry syrup over the entire pavlova. I wanted this grand lady to shine so I chose to have a fairly simple background. I used a vintage milk glass cake stand purchased at the Salvo’s, and the vintage doily and the antique silverware jug in the background which were purchased for a few dollars at Vinnie’s. The surface is a rescued old weathered timber coffee table-top pulled out of a council hard rubbish clean-up. The only light used in this image is window light. That is a gorgeous dessert! Thanks Carrie for your feedback and for reading my blog. Thanks for your feedback Tessa and for stopping by my blog. Happy cooking! Wow! What beautiful photography? What equipment do you use? Thanks for your feedback. I’m very minimalist when it comes to equipment these days. After twenty years of professional shooting I’ve been through countless analog and digital cameras and these days I shoot on a Canon 5d Mark 3 with a 100mm f2.8 and 28-70 f2.8 lenses. I have a back up body, a very small lighting kit which I barely use preferring daylight. I travel light. This is the sort of dessert people just don’t make anymore, at least not in the states. Thank you for the insane temptation and visual delight! I’m definitely adding this to the list of my must-makes! Thanks for stopping by my blog and for your kind words. I thought the best most over the top cakes came from the USA, Martha is always coming up with wild creations. It’s not common here either for big desserts except for weddings and special occasions. I love a bit of fantasy and extravagance so I’m all for whipping up this sort of thing, providing it doesn’t involve too much detailed cake decorating (the messier the better in my books). Happy cooking and be sure to stop by again. This dessert looks absolutely mouthwatering! I think I will try it for our next gathering. Thanks for sharing! In the recipe, you haven’t included the vanilla essence. Should this dessert be served cold? Thanks for the Pavlova. I lived in Australia for 3 and a half glorious years. I loved the celebrations. I think I might make the Pavlova for the fourth of July. I’ve only been gluten-free since October and am surprised by the wonderful results. This a looks so incredible! I tried to make this yesterday with a friend and the meringue tops crumbled and separated from the insides when we tried to transfer them to the cake stand. We attempted to hide it with cream and chocolate, but it still looked quite laughable. It tasted amazing in the end, though! SO GORGEOUS. i love that you added styling comments to the bottom of this post. food styling has become one of my favorite things to explore. this post inspires me to make a pavlova pumpkin spice latte flavor, too. This looks awesome and will definitely try. Essentially, this is not a Pavlova but a Meringue. The essential ingredient to a Pavlova is the Corn Flour, which results in the pavlova having a crisp and crunchy outer shell, and a soft, moist marshmallow-like centre, unlike meringue which is usually solid throughout. Also, eggs MUST be at room temperature. Thanks for posting such a lovely family recipe! Oh my god, it’s absolutely beautiful! I made this for friends last night. Fantastic! Here’s my advice: Make this in the morning! You will not have access to your oven for most of the day. Also, I don’t advise if you’re also making dinner. This was fun to make, but a bit labor intensive. I had friends over for just dessert. With this one, just dessert was plenty. Thanks for a great recipe! Just made this for Thanksgiving. Mine wasn’t nearly as beautiful as yours (still getting the hang of meringues) but it was delicious and a HUGE hit. Thanks for a great recipe! I will definitely make this for Christmas. Absolutely stunning picture! I love the props! Thanks Tanya – Merry Christmas! When you drop the temp is that in ferinheight? How do you cut and serve this? Pretty crunchy, I would think. Looks delish tho. Hey Tan – Finally made this today! Delish – it was a hit, and easy too, but mine was still very soft on bottom and middle and lots of it collapsed! It was ok but sure didnt end up looking like yours! Not enough time to cool down I suspect? This looks fantastic! I was hoping to make something like this, but to serve 15-20 people. How many servings did this make? It is a complete circle, not a ring. Once I turn off oven, I leave meringues in overnight to cool. You didn’t state what measurements we should use for scooping out the meringue mix and baking it. How many grams should each meringue be???? This was so much fun to make especially catering to some gluten free and grain free friends. I was also happy to have used a darker chocolate (72% cocoa) for the topping at the meringue is quite sweet. I also was surprised at how quickly the cocoa mixed in the the meringue mixture. next time I would barely touch it before putting it onto the parchment paper in order to maintain the swirls. This is a gorgeous looking dessert, and I am eager to make it later this week for a dinner party. 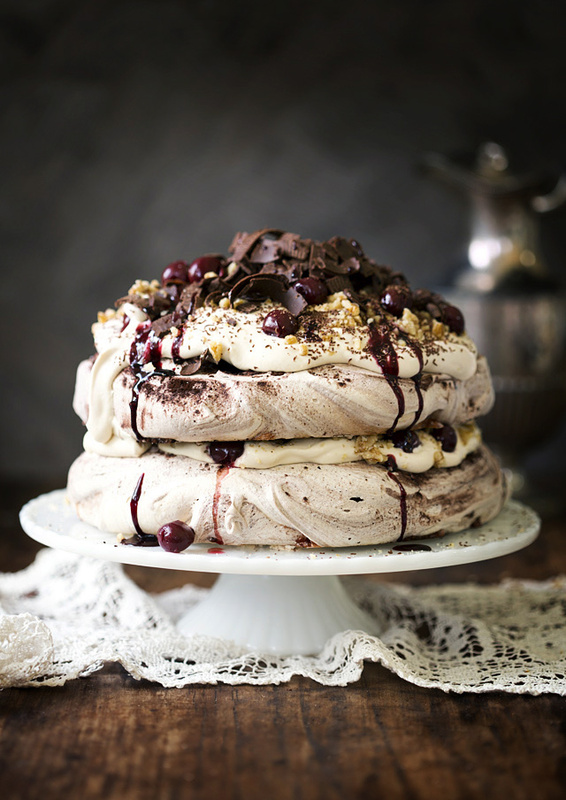 Would it be okay to make the meringue portions the day ahead, as well as prepping the cherry topping, whipped cream, and chocolate shavings the day before and then assemble everything right before leaving for the dinner? I assume as long as I am careful and leave the baked portions in the oven/airtight container it would be okay to leave the assembly for a last minute step right before serving. it is a beautiful photo, however on my first attempt to make this (for dad’s 93rd birthday) the mixture, on cooking, just flattened out into an unusable mess. I think the granulated sugar was way too heavy and there’s just too much mixture to handle successfully. The recipe I usually use (same quantities) has a teaspoon of vinegar so on making the meringue the second time I added the vinegar, used castor raw sugar and only 1 dessertspoon of cocoa (a substitute for the usual dessertspoon of cornflour). I also made only half the quantity (used 4 large eggs) and this was plenty to make a spectacular pavlova. I read (on Nigella L’s site) that the acidity of the vinegar holds the egg-white together. Anyway we had a beautiful night and the black forest pavlova was a hit and leftovers are still delicious today, so thank you! Hi Tanya, Have you ever made these on a smaller scale? Like individual serving sizes? I’d like to try this but make multiple single servings. Do you have a suggestion on adjusting the baking time for that? Thank you! Hi Kate, I haven’t made this particular pavlova as individual servings, but you could try adapting this recipe http://tanyazouev.com/caramelised-individual-pavlovas-with-cardamom-vanilla-cream-cointreau-raspberry-sauce/. The raw meringue is essentially the same recipe however you would need to add the cocoa swirls by sprinkling then swirling. Hope it works for you. Wow, tried the expresso/chocolate Pavlova sooooooooo nice thanks so much our guests loved it. Looks fantastic – I’m going to try it tomorrow! And very appropriate for me growing up in the 70s in NZ where no sophisticated meal was complete without the pavlova topped with sliced kiwi fruit! Do you need so much sugar to make this. I love pavlovas and so does my husband but he has cancer and doesn’t eat sugar where possible. So would a small amount still get the results?? Sorry to hear of your husband’s illness. Unfortunately pavlovas tend to sink if there isn’t enough sugar. I’ve tried halving it and it doesn’t work. You might like to experiment with refined sugar alternatives like xylitol, available at health food shops. I LOVE making merginue anything and this is so special. What a lovely recipe, so happy I found it. I’m spending Christmas with my son, his girlfriend and her family this year. I volunteered to bring the dessert, guess what I’ll be taking? Thank you so much.